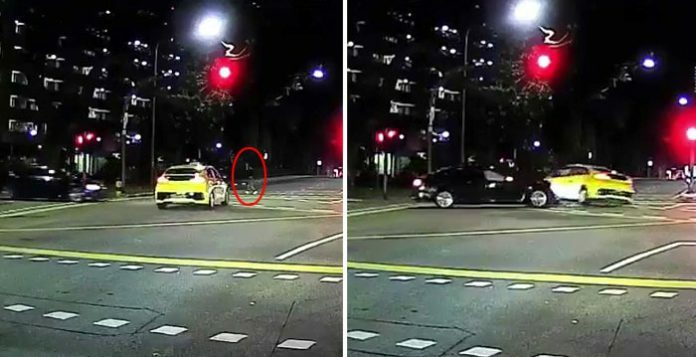 Dashboard camera footage of a car accident at Jalan Bukit Merah has been going viral online after it showed that the crash actually diverted a speeding taxi that had beat the red light and was careening towards a pedestrian. The incident occurred this past Wednesday, around 8pm. In a video posted on social media by Roads.sg, a pedestrian can be seen rushing across the road while the traffic light shows red for cars to stop. A taxi, however, runs the red light and heads right toward the passenger when a black car moving from the left rams into the side of the taxi before it could reach the pedestrian, inadvertently saving the pedestrian’s life. While netizens are showering praise on the car driver for saving the pedestrian’s life, the police have reported that a passenger in the car was conveyed to Singapore General Hospital in a conscious state. It is unclear whether there were any other injured parties.